FARGO, N.D. – The Fargo Force will be represented by 28 alumni playing for a national championship in the NCAA Division I Hockey Tournament when it begins on Friday. UMass leads the way with five Force alums, Minnesota State has four, and St. Cloud State has three. Jared Hilderman and Riley Tufte won a national championship with Minnesota Duluth last season and will look to become the first team to repeat as champions since Denver in 2004 and 2005. Fans can watch St. 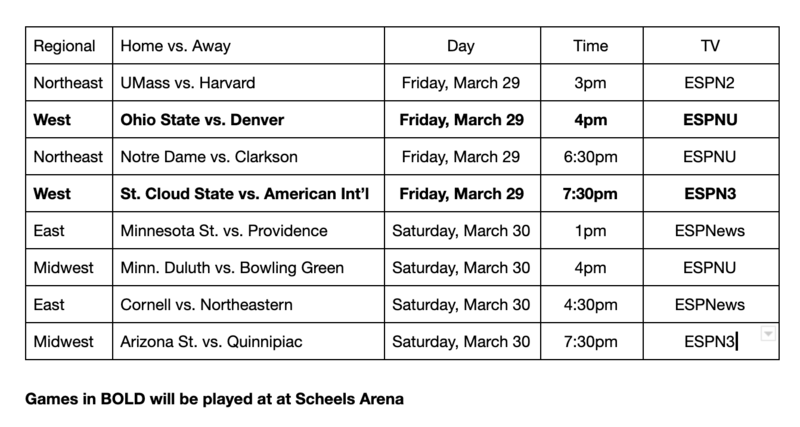 Cloud State, American International, Ohio State, and Denver compete in the West Regional at Scheels Arena this Friday and Saturday. In addition to the players on the ice, the Force will also be represented behind the bench by three coaches in the tournament. Former head coach Jason Herter is the associate head coach at Minnesota Duluth. Nick Oliver, a former player, is an assistant coach with St. Cloud State. Josh Hauge, a former assistant coach, is an assistant coach at Clarkson. The schedule for the first round of the tournament can be found here. The Force will return to Scheels Arena Apr. 5-6 for their final home series of the regular season against Team USA. Puck drop for Friday and Saturday is scheduled for 7:05 p.m.